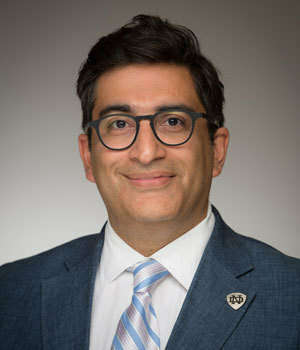 Nitesh Chawla, the Frank M. Freimann Professor of Computer Science and Engineering at the University of Notre Dame has been named the recipient of the 1st Source Bank Commercialization Award. Chawla received the award, which carries a $20,000 cash prize, for innovating a new data science software, Aunsight, allowing data scientists and business analysts to deliver on the business value proposition of big data analytics. Chawla, who also serves as director of the university’s Data, Inference, Analytics, and Learning (DIAL) Lab, and director of the Interdisciplinary Center for Network Science and Applications founded the data science software and solutions company Aunalytics in 2012 with seed funding from private partnerships and envisioned Aunsight as the company’s signature product to streamline the data science process – from computing infrastructure to insights. Aunsight powers the Enterprise Data Management and Analytics Platform offered as a service that resolves the complex elements of computing infrastructure, data management, data processing, algorithm development, and ultimately delivering insights and solutions driving business value. Aunalytics’ leadership team and staff include graduates from universities spanning coast to coast, including Notre Dame, Stanford, Indiana, Michigan, Chicago, Loyola, Gonzaga, Waterloo and Stony Brook. Established in 2008 with a $1 million gift from 1st Source Bank, the commercialization award is presented annually to faculty from Notre Dame or the Indiana University School of Medicine-South Bend who have successfully transitioned their technologies from the lab to the marketplace. 16 partnering entities ranging from incubators and entrepreneurial programs to patent law support and Cleveland Clinic Innovations. The 1st Source Commercialization Award, signing and ceremony is an annual event, and part of the Innovation, De-Risking, and Enterprise Acceleration (IDEA) Center at the University of Notre Dame, supporting a vibrant culture of research, innovation, and commercialization. Originally published by Jessica Sieff at news.nd.edu on April 18, 2017.